According to the Fourth National Climate Assessment, humans are the dominant cause of global temperature rise, which many believe is directly responsible for the increased intensity of extreme weather events. The assessment shows that extreme events have cost the U.S.more than $1.1 trillion since 1980, and also warns that “The frequency and intensity of extreme high temperature events are virtually certain to increase in the future as global temperature increases”. We have only to look to Texas, Florida, and Puerto Rico where major hurricanes caused catastrophic damage to the electric grid creating heightened concern for resiliency. The inability to re-establish power quickly in these jurisdictions is ultimately a reflection of their antiquated grids and the need for new policies promoting resilience using advanced technologies. In October, at an Energy Subcommittee hearing examining resiliency, a witness advised federal lawmakers that “policies must keep pace with technologies”. And across the country, state energy commissions have commenced proceedings looking to expand the adoption of distributed energy technologies. While New York, California, and most recently, Rhode Island continue developing grid modernization policies relying on advanced technologies, jurisdictions most vulnerable to extreme weather should also initiate similar proceedings focused on integrating distributed energy technologies to improve resilience. 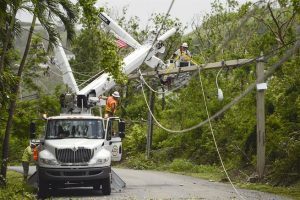 Puerto Rico in particular has a chance to rebuild its electric grid for the next generation by connecting as many advanced energy technologies as possible. Implementing policies that integrate distributed renewable energy, coupled with energy storage to support critical infrastructure can help the grid in these vulnerable areas effectively mitigate otherwise serious threats. With long-term outages, distributed energy would demonstrate its ability to quickly power public services like municipal treatment plants, traffic lights, first responders, and medical care. On the transmission side, bi-directional sectionalizers and reclosers can segment the electric grid when portions of it are knocked out. The grid can also incorporate “smart switching” to direct working electric generation towards operating electric feeder lines. Within a segmented grid, we can also improve resilience by integrating microgrids and community solar within each segment to isolate itself so as to remain operational when parts of the grid go down or are damaged. 1. How should regulators craft policies to support or encourage grid resiliency during extreme weather events? 2. Should resiliency requirements be reexamined or expanded? 3. What can weather vulnerable locations learn about improving grid resilience based on the modernization proceedings in states like New York and California among others? 1. The best way to craft policies is to provide a goal. Set an energy efficiency goal to reduce consumption by X. Then provide a list of practices which help achieve that goal. 2. Many cities are hiring Directors of Resilience. With the ever-evolving technology and codes. Updates are becoming commonplace. 3. Diversification is key. Microgrids worked for a vineyard in California during the wildfires. A portfolio of renewables, current energy generation and technology will greatly advance areas like the Caribbean so the next time there is a Storm, buildings don’t blow down, the power doesn’t go out, and we are able to save property and reduce the loss of life. We have the technology today. The Paris Agreement provides a good backbone and global market for energy efficiency and use of renewables. Scott’s presentation about some of the benefits of distributed energy is correct and could well be expanded beyond the effects of extreme weather on our supply of electricity by including issues of cyber security, operator error, sabotage, and insufficient capacity margin, all of which can also bring about widespread losses of electricity. Further, no discussion of distributed energy is complete without bringing up the need for distributed energy storage and the cost of such distributed storage. To fully explore the issue of resiliency during extreme weather events, one needs to consider both vulnerabilities in the transmission grid and in the sources of electricity themselves. As I understand the present situation in Puerto Rico, the loss of the electric grid, not the power plants, is the principal source of the widespread loss of electricity. A similar event happened years ago when a severe ice storm struck Quebec and portions of upstate New York and New England. There are alarming photographs available on line showing how ice twisted electricity transmission towers into pretzel-like configurations. One may consider if part of climate change will be an increased frequency and larger affected areas from extreme cold or ice conditions, not just hurricanes. Perhaps the recent polar vortex was an early manifestation of climate change. So the need for distributed energy resources plus distributed energy storage because of extreme weather and because of man-made causes is particularly important when dealing with transmission failures. However, the subject of resiliency also requires a discussion of the vulnerabilities of the sources of electricity during extreme weather events. Some information is becoming available as to the survivability of roof top solar installations and of wind turbines during this recent spate of huge hurricanes. What has not been fully explored, in my opinion, is the vulnerability of large off-shore wind farms, such as the proposed wind farm some 30 miles off of Montauk Point, New York. Such a wind farm is not a distributed energy source so it doesn’t quite fit Scott’s presentation. More important though, is the fact that this wind farm, of about 400 huge wind turbines twice the height of the Statue of Liberty, is only rated to be capable of withstanding a category 3 hurricane. Hurricane Sandy which severely damaged New York and New Jersey was a category 5 hurricane, much like the large hurricanes seen in 2017. What would happen to this proposed 30 mile off-shore wind farm if it were in the path of another Hurricane Sandy? In general, those energy sources exposed to the benefits of nature are inherently also exposed to nature’s detriments. With regard to the vulnerability of centralized power plants to the effects of extreme weather, much can be learned from the nuclear industry. By design, considerable efforts are made to prevent radioactive material from entering the environment even under extreme events. These same efforts to prevent radioactive material from entering the environment also serve to prevent extreme natural events from initiating an accident sequence. The containment building at a nuclear plant is just one example of such a barrier. In the United States nuclear power plants have withstood, without any release of radioactive material, the effects of a category 5 hurricane, floods, tornadoes and a beyond-the-design-basis earthquake. One has to look beyond the United States to find a case where an extreme natural event led to a release of radioactive material, specifically Fukushima, where three simultaneous reactor melt downs occurred. The Fukushima plants withstood a greater than magnitude 9 earthquake and their emergency equipment operated as designed for a while. Their emergency diesel generators failed about 30 minutes after this massive earthquake when they were struck by an unprecedented tsunami about 30 meters high, causing a total loss of electric power at these plants. Even with three meltdowns the release of radioactive material was rather limited and the World Health Organization has determined that there were no radiation-caused early fatalities and long term effects would be too small to be detectable. Nature teaches us that part of achieving resiliency is to have diversity. Gong forward towards a low carbon future to protect against extreme weather and other causes, we would be better served and more resilient if we had the diversity of distributed renewable energy sources and its associated distributed energy storage, plus centralized nuclear power plants plus heavy emphasis on conservation. Good points, Herschel. I’d like to offer some personal observations regarding extreme weather events that I’ve experienced. I ran a commercial fishing boat in the Bering Sea for 20 years, and I lived in Guadeloupe in 1989 where Hurricane Hugo made its first landfall, with gusts that broke the world wind speed record (235 mph, beating Mt. Washington’s 231 by a hair). I cannot imagine that any sort of solar installation would survive a Hugo-like hurricane. Likewise wind turbines. So-called “hurricane-proof” utility poles littered the landscape along with everything else. It’s expensive, of course, but running power lines underground is the most sensible course of action in hurricane-prone areas if you really want to storm-proof the grid. And expect to lose all your wind and solar in an extreme event like Hugo (or even less than Hugo). There’s no way that solar panels would survive. Half the houses were swept from their foundations, and the very sturdy houses like ours that had reinforced concrete roofs with galvanized roofing on them survived (barely) but the galvanized roofing was completely torn away quite a while before the eye hit with its maximum winds. Rooftop solar installations wouldn’t survive either. Granted, Cat 5 hurricanes are relatively rare, but they will happen eventually in virtually every place that’s subject to hurricanes. So does one spend more money and plan systems that can survive them, or do you save money and hope that you’ll be dead and gone before the next big one hits? In Puerto Rico’s case, underground power lines make good sense because it’s right in hurricane alley and can expect these events to happen again in the not too distant future. Ditto almost anywhere in the Caribbean or Gulf of Mexico. Besides, putting the power lines out of sight is far superior from an esthetic point of view. Sadly, I doubt very much that it’ll be done in Puerto Rico. They’re just putting up power poles again. Faster? Sure. Cheaper? Yup. Smarter? There are projects installed in Greenland, throughout the Pacific that have weathered monsoons, typhoons, hurricanes. Some distributed wind systems can be winched down to ride out the storms and winched upright. I have surveyed solar systems that have ridden out successfully Harvey, Maria and Katrina, and have spec’d projects up to 300 mph winds for military and critical infrastructure applications. Burying wires solve some problems (they don’t blow down) but they do flood out (and short out) and they also have immense problems with rodents. Thanks for contributing. Regulators should craft policies through application of the scientific method of inquiry. To apply the scientific method is not what they currently do. Replacing the scientific method is a pseudoscientific method under which regulators cater to the political needs of policy makers. Options for providing resiliency to the electric power network in the case of extreme weather events need to be evaluated using a rigorous cost-benefit analysis. Plausible scenarios of hurricanes hitting the region over time need to be established, and the economic damage to the region of each scenario by a lack of power needs to be estimated. For each resiliency option, the costs of implementing that option need to be compared to the benefits in terms of economic damage avoided. For example, the costs of burying power lines underground needs to be compared to the estimated costs of lost electric power and costs of rebuilding above-ground power lines for each hurricane scenario. For distributed solar power/storage as opposed to centralized solar power/storage, the additional costs of distributed energy would have to be computed and the likelihood of providing power under a hurricane scenario estimated. The solar options would also have the additional important benefit over fossil-fuel based electric power of reducing CO2 emissions. This is the only way one could make an informed decision about how much to invest in various resiliency measures to the electric power network. This question is premised on the alarmism contained in the National Climate Assessment. A careful review of the document and its references shows that heat waves are no more frequent than in 1900. The claim about accelerating sea level rise is inconsistent with the cited research papers that show that the recent rates are statistically indistinguishable from peak rates in the 20th century. As for hurricanes, NOAA has stated that it cannot detect any human influence on hurricanes. Hence, the proposition is factually invalid. That does not mean that resilience should not be factored in upgrading and repairing electrical grids. Rather than prescriptive regulations, the electric utility industry should develop performance standards in consultation with DOE and states and territories that have high vulnerability like Puerto Rico. Dan, Instead of relying on secondary sources–NY Times and USA Today–you should go to the source documents in the National Assessment that I cited. You also use a secondary source on hurricanes instead of NOAA. Your response is just silly and shameless. Hurricanes: The increasing intensity of the strongest tropical cyclones, James B. Elsner, James P. Kossin & Thomas H. Jagger, Nature, Vol 455|4 September 2008|doi:10.1038/nature07234 (also other references to peer-reviewed papers in the original link). So, my response is not silly. Your post, claiming that the impacts of climate change are not occurring and/or are not something to worry about and plan for, is not silly, but it is dangerous. Your recollection of Hansen’s predictions and mine are worlds apart. In the 1980s, it is my recollection that his predictions for this time period bear little resemblance to what has actually taking place. As for long term predictions, name one for a period over 50 years from the date made that has been accurate. Chaos theory along with unknowns make the probability close to zero if not zero. University of Alabama in Huntsville. Bill: My recollection of Hansen’s predictions is not faulty because what I quoted came from Hansen’s 1981 paper! I’m glad I’m able to correct your faulty recollection. As for Hansen’s temperature predictions, deniers try to discredit them by comparing the actual temperatures to one of Hansen’s emissions scenarios that didn’t happen. Hansen based his predictions on what the future emissions of fossil fuels might be. As it turns out, global warming is actually determined by human emissions of greenhouse gases! Who knew? Anyway, when you look at Hansen’s predictions for the greenhouse gas emissions that actually took place, you see that he got the temperature prediction right. There is an analysis of his temperature predictions in the phys (dot) org link I provided. There is also a detailed analysis at RealClimate (dot) org. You are correct that there is no scientific evidence that climate change creates more hurricanes. But according to NOAA there is evidence that, “Anthropogenic warming by the end of the 21st century will likely cause tropical cyclones globally to be more intense on average (by 2 to 11% according to model projections for an IPCC mid-range scenario). This change would imply an even larger percentage increase in the destructive potential per storm, assuming no reduction in storm size.”. Melting ice caps and glaciers will raise seas levels and exacerbate surges. Terrorism is increasing as is human-induced violence. The point being, there are many rationals for enhancing resiliency, cybersecurity, and efficiency. We would be derelict not to do it. Hansen’s 1981 future temperature predictions were also very accurate. So, it is possible to predict things decades into the future, especially when they are based on science. But, if you were right for some reason that things can’t be predicted, then the Precautionary Principal would hold and you would need to assume the worst case scenario and act based on that. In this particular case, the predictions are for a catastrophic outcome if we, as you are suggesting, continue to not act. Not acting clearly puts our children in danger. Dan, when I have the time I will review the paper you cited. I am not interested in the Real Climate assessment because I don’t know who did it. In the meantime, if his model was so good why are there so many different models still be used that have done a poor job of predicting temperatures over the past 20 years and why does the IPCC make cautious statements about model accuracy? Bill: The RealClimate temperature analysis was done by Geert Jan van Oldenborgh and Rein Haarsma of The Royal Netherlands Meteorological Institute (KNMI). Do you only accept science done by people you personally know? So we have a good idea what will happen if we act or don’t act. While I don’t want to put words in your mouth, you seem to strongly suggest that we should not take action now on climate change because predictions of the impacts of inaction are uncertain. If I got this wrong, please let me know what you are suggesting. Dan, you may not want to put words in my mouth but you come awfully close. I have spent more time on this question and the back and forth with you than I intended. We are not narrowing our differences, so this is my last response. I have cited John Christy’s 2016 testimony which explains why skepticism over models is not unreasonable. If you think about it, the number of variables, the varying degrees of accuracy, and the effects of chaos explain why even the best is not very good and why caution is justified in using their results for policy. The IPCC’s estimate of climate sensitivity captures the overall uncertainty and undermines the justification of certitude. That estimate, which varies by a factor of 3, is essentially the same as it was 20 years ago. For the reasons cited, I do not support long term commitments which have very high costs and uncertain benefits. I do support near term actions to deal with nearer term and better understood problems. We know that sea level rise, independent of how much is from rising temperatures and how much is caused by the continuing effects of the end of the last ice age, is a problem. We know what actions can be taken now to mitigate its effects and flooding. The Dutch have shown us how. We also know that crop seeds can be modified to deal with extreme heat or delayed springs. The list could go on but you get the point. Instead of the constant attacks from believers and skeptics, I favor actions that can narrow the differences that are all too evident in this debate. The Red Team/ Blue Team proposal by Steve Koonin is worth trying for that reason. Bill: Thanks for your reply. As you probably know, there is no such thing as certitude in science. There are theories, such as the theory of gravity, that do a pretty good job of predicting outcomes. Even though science is uncertain, it can still inform us about the world and what will likely happen if follow certain courses. We do know that our CO2 emissions last in the atmosphere for hundreds to thousands of years and we understand well the properties of greenhouse gases. We also understand quite well the dangers of warming the planet by even 1ºC and are sure enough of the dangers of +4ºC warming that it is prudent to take steps now to avoid that level of warming. We also know that the effects of warming take a while to kick in (e.g., the melting of glaciers) and these effects, once underway, last for thousands of years. So, knowing all this, while it sounds reasonable to some people that we should “wait and see” or “just do things that help right now” until we are “certain” of the future (and we will never be certain of the future), that approach will likely lead to catastrophe. We would never take such a cavalier approach with other dangers that could effect our children and we should not be taking such an approach with them with regards to climate change. Bill: The predictions are not the severity of storms and frequency of severe storms. My advice to you and other climate skeptics is that a conservative approach dictates adopting policies and practices that reduce carbon emissions at the lowest possible cost or at no cost at all. As McKinsey & Company has shown, many energy efficiency measures not only don’t cost money they save it. As for the veracity of the science, if you don’t believe that carbon emission is a major threat to the planet, consider what we are doing by burning fossil fuels. We are simply returning sequestered carbon — buried over millions of years — to the atmosphere and will eventually achieve a climate consistent with what it was before the sequestration. The Earth was a much warmer planet 65 million years ago when the dinosaurs roamed it. Distributed energy is not the solution to grid resilence, at least not until it is universal, which is decades or longer away. The reason is simple, even if 20% of homes have DEG, what about the other 80%? It may aid reliability in some situations, where there is a loss of transmission lines or power plants, but DEG and local storage are merely one tool in the kit. However, reality checks are in order. No grid is 100% reliable, most power loss events are local distribution disturbances (squirrels committing seppuku on transformers, vultures defecating on power lines, I kid you not, it’s a real problem in the southwest), and many transmission events are unavoidable. It comes down to the same cost-benefit analyses used for resource adequacy, what is the value of reducing the incidence of power losses and how much does it cost to reduce that probability by “X” amount. So you can put lines underground at tremendous expense (not just the initial dig, but maintenance costs), harden above ground structures, invest in redundancy, etc. One way to reduce these costs is to limit building in flood plains and vulnerable areas along the coast, as providing reliability to areas that are more likely to be subject to extreme weather damage will be more costly, and those who place themselves in harms way should bear the burden. On the other hand, random events like tornadoes are hard to avoid unless we want to depopulate Oklahoma and Nebraska and return it to the Buffalo. There is a balance between social sharing of costs and asking ratepayers and taxpayers to subsidize someone’s preferred lifestyle (whether it be living in Manhattan or along the Florida coast). As far as the validity of long-term predictions, they are rarely correct (neither are short-term economic predictions for that matter), for numerous reasons. However, that doesn’t mean they should be ignored, rather, they should be taken in context. The Club of Rome was simply a bad model, I worked with it in my first graduate school experience, and it lacked any sort of feedback effects due to price or endogenous technological change. Climate models are underspecified and lack sufficient information (because data over much of the oceans is limited), but if you don’t expect precision, they’re still valuable. The evidence of climate change is overwhelming, I must have close to a thousand peer reviewed articles on my hard drive attesting to various aspects of this change, and its source in human activities. Denial is either cynical or foolish. Catching up on my Our Energy Policy reading … I would like to quote a native American proverb for Mr. O’Keefe. It is another way of looking at the future with a ‘precautionary’ stance … taking the umbrella with you when rain is predicted and being happy if it doesn’t actually rain. So let’s see smart policies to meet sea level rise get put in place …. soon. Distributed energy, as a major source of green power, will require reliable, economically viable energy storage, which currently does not exist. Continued advanced battery research is essential to achieve that goal. Before storage research yields fruit, policymakers need to ensure that utility companies devote adequate attention to line maintenance–including tree clearing and more frequent pole replacement in suburban and rural areas. In urban areas that have underground lines, resilience against flooding must be a top priority. For long distance transmission, greater redundancy would help not only with resilience to major weather events, but also to potential terrorist attacks. I spoke about the latter problem more than a decade ago at a global energy meeting in Washington, but I have not seen much progress.